Would a David Attenborough Impression Suit Your Project? Are you looking for a David Attenborough Impression? Thank you for visiting the page of one of the UK’s most in-demand David Attenborough impersonator. 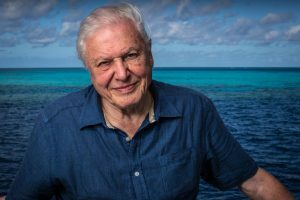 One of the most recognisable voices on British and US television has to be nature documentary film maker, Sir David Attenborough. To millions of people his voice is unmistakeable, as they have grown up watching his films and seeing him journey across the planet to bring us the wonders of nature. As such, his unique tones are called upon by a lot of people looking for that gentle, whispered style, whether it be for a nature documentary, web video, advert or character spoof. In 2016 I made it through to the live semi finals of Britain’s Got Talent performing celebrity impressions. Among the comments I received was how much people loved the way I deconstructed celebrities voices and broke them down. The BGT sponsors, The National Lottery asked me to do some extra filming for them and present a competition where I taught people a step by step approach on how to impersonate Sir David Attenborough. Here’s a masterclass on how to deliver the perfect David Attenborough Impression! Since then, I have voiced countless videos using my Attenborough voice and am the most in-demand David Attenborough impersonators in the UK. Here’s a fun advert for RyanAir. I was contacted by the makers of Big Brother in the UK to go into the studios and voice as Sir David for a wildlife task! It was an incredible experience, as I sat in the booth directing the poor housemates, commentating on their behaviour and watching them turn into animals! I’m now contacted by individuals and production companies from all over the world to narrate videos, tv commercials and radio adverts in David Attenborough’s style, including promos for BBC Radio 1 and I’m happy to give you an accurate impression of Sir David, a parody, or simply voice “in the style of,” to suit the tone you have in mind. Here’s a corporate video I presented for Lawbite, which feature a bunch of celebrity impressions, including Sir David. So, please do get in touch and I’ll be happy to work with you to get the style you require for your David Attenborough! Alternatively, for more characters and celebrity impressions, visit my soundboards.